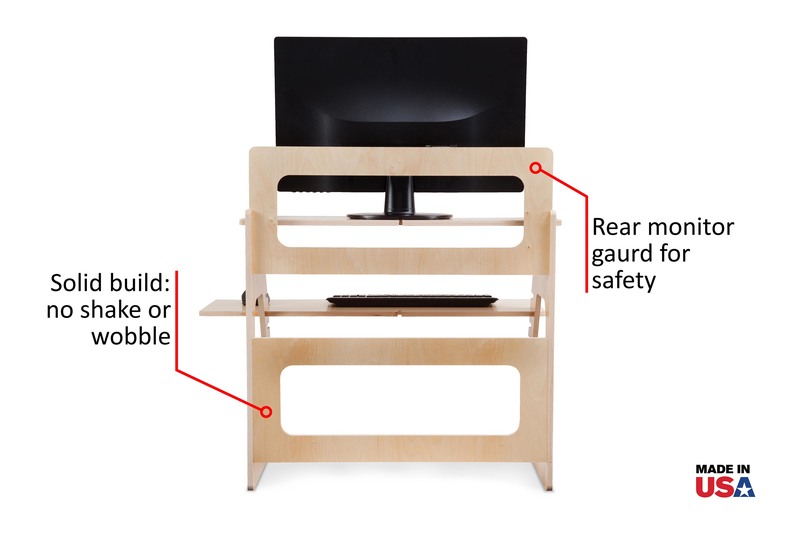 SIMPLE, RELIABLE and EFFECTIVE height-adjustable computer desk for your single monitor or laptop workstation. 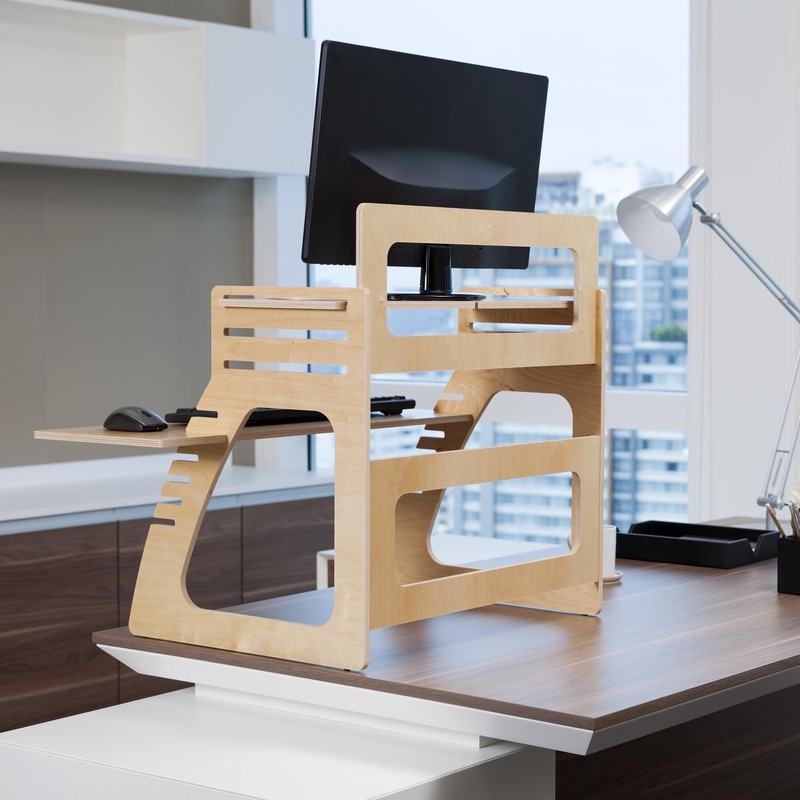 Enjoy a hassle-free transition to standing at your office desk. CUSTOMIZE FOR YOU: Create the perfect ergonomics on your existing desktop with variable height keyboard and monitor shelves. Simply select slots for your ideal arm alignment and monitor viewing height. 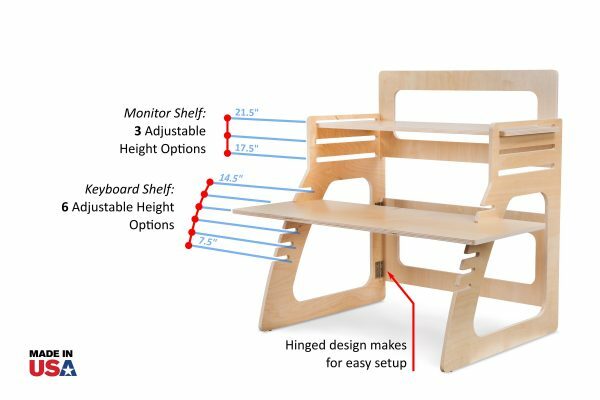 Typically accommodates users 5’3″ to 6’1″ tall. TOOL-FREE assembly in less than 60 sec. SUPERIOR DESIGN: The Well Desk Wooden StandUp Converter is constructed with HIGH QUALITY and PRECISION CUT Baltic Birch Plywood with an epoxy acrylate finish for a great looking and durable surface. Includes a rear monitor guard for tip-over protection. This adds up to a solid desk you can depend on. YOUR HEALTH is our priority: We are real people who use our own products every day. This is why we believe in creating SIMPLE ERGO SOLUTIONS which anyone can easily adopt. Standing at the computer can improve everything from heart health and musculoskeletal issues to mental focus and productivity. Turn Your Normal Desk Into A Standing Office Desk. Studies show that sitting all day can lead to serious problems with your physical health. Back pain. Weight gain. Even heart disease. That’s why health experts now recommend standing up at work a few hours a day with a raised desk. But who can afford an expensive specialty standing desk? 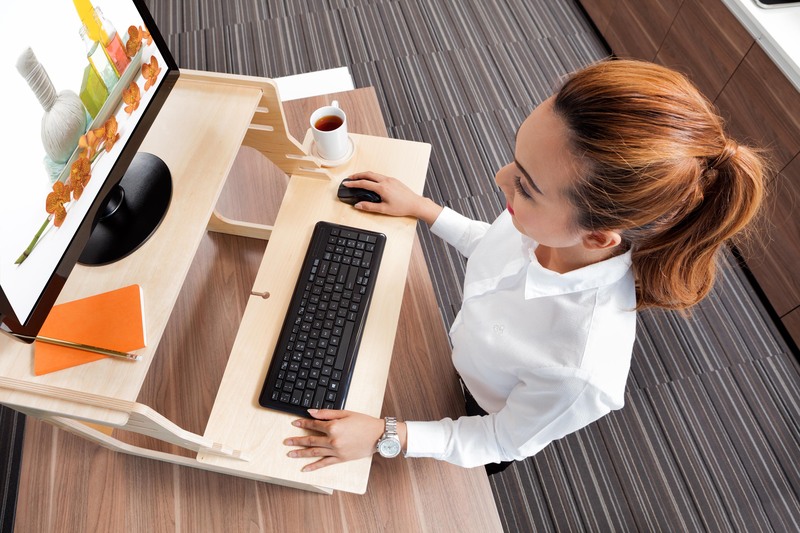 Now – with the Well Desk Standing Desk Converter – you can simply and affordably convert your existing desk into a standing with no tools required! 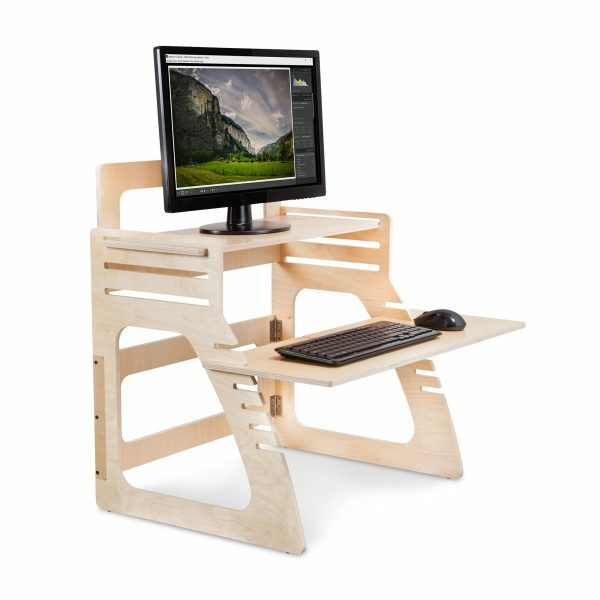 It is easy to install, and the benefits are plentiful with this ergonomic office desk. Fits on top of any standard desktop to provide you with a standing office desk. 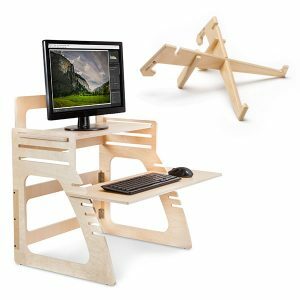 Accommodates up to 24″ monitor and supports up to 35 lbs. Easily adjusts to user’s height, from 5’3″ to 6’1″. Slip-proof feet help prevent sliding. 30″ keyboard shelf fits all keyboards and mice. 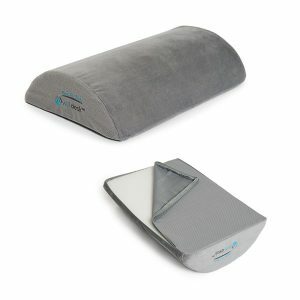 Now You’re Ready to Stand Up for Comfort! Feel alert and revitalized. You’ll burn up to 50 calories MORE per hour versus sitting, and you’ll get real relief from back pain. The Well Desk Standing Desk Converter is crafted from the finest Baltic birch plywood, precision-engineered so all parts fit together snugly. 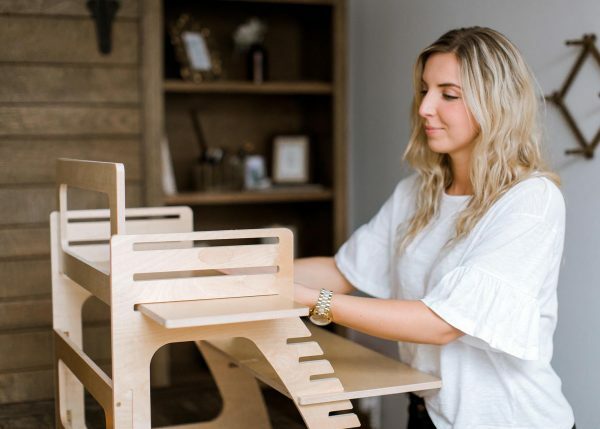 The results are: a sturdy, reliable desk that helps you reach your wellness goals – that’s why we call it the Well Desk! Why waste away at a standard sitting desk? Upgrade to a standing office desk to turn your normal workstation into a more efficient one. Why pay $1,000 or more for a cumbersome full-size standing desk? Order our lightweight, affordable Well Desk for your home office or workplace at a reasonable cost. Well Desks comes with a money back guarantee. All parts are guaranteed, including parts damaged during shipping. Order Your Well Desk Today!